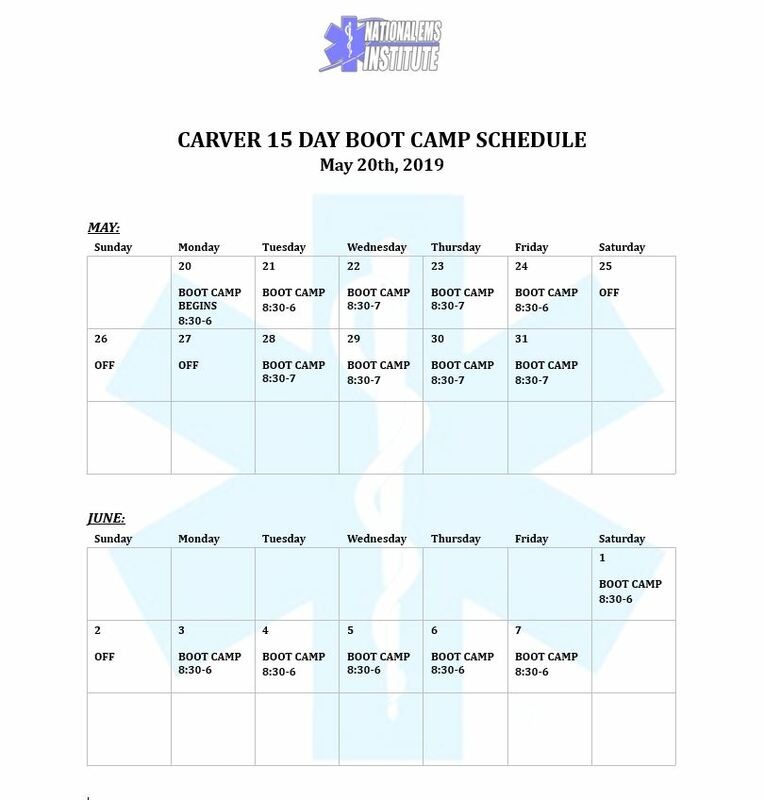 Prepare for your future during National EMS Institute’s Special 15 Day EMT Boot Camp course. No other school has a program this fast and State accredited in all of New England! This fast-paced EMT Training course will prepare you to provide emergency medical care to victims of accidents and sudden illness. Students will develop skills in symptom recognition, emergency care procedures and techniques. Emergency Medical Technicians provide routine and emergency medical care with an ambulance service, as well as in hospitals and clinics. Becoming an EMT is the first step towards becoming a paramedic. The Special 15 Day EMT Boot Camp is an extremely fast-paced program that covers the entire EMT curriculum. This 15 day course is specifically designed for our College Student customer base. Our Instructor tailors lectures to meet the needs of PA students, biology majors, and nursing professionals. Our program consists of 140 hours of classroom and skill training, and the opportunity to participate in a variety of educational opportunities. This program exceeds the US DOT/DPH/OEMS guidelines. The instructional staff consists of EMTs and Paramedics with years of experience as EMS educators. CPR (BLS for healthcare providers)- This course for healthcare professionals teaches you to recognize several life-threatening emergencies, provide CPR to victims of all ages, use an AED, and relieve choking in a safe, timely and effective manner. Glucometer- This medical device is used to determine the approximate concentration of glucose in the blood. EMT’s will use this information to draw a small drop of blood, obtained by pricking the skin with a lancet, then placed on a disposable test strip that the meter reads and uses to calculate the blood glucose level. BLS Advanced Airway/Intubation Assistance- This lifesaving procedure helps unconscious patient’s breath. You, as a student will learn how to perform an tracheal intubation. Bloodborne Pathogens- Bloodborne Pathogen training addresses the federal OSHA “Occupational Exposure to Bloodborne Pathogens” standard (29 CFR 1910.1030) which prescribes safeguards to protect workers against the health hazards from exposure to blood and other potentially infectious materials and to reduce their risk from this exposure. Narcan Training- When a person is overdosing on an opioid, breathing can slow down or stop and it can very hard to wake them from this state. Narcan™ is a prescription medicine that blocks the effects of opioids and reverses an overdose. Nebulizer- is a drug delivery device used to administer medication in the form of a mist inhaled into the lungs. These are commonly used for the treatment of cystic fibrosis, asthma, COPD and other respiratory diseases. Course Materials: Textbook- Emergency Care and Transportation of the Sick and Injured by Pollack. ISBN: 978-1284032840. Q: Is National EMS Institute Inc. accredited? Q: I do not live in Massachusetts can I still take the course? Q: Does National EMS Institute Inc. offer Housing to Students? A: Yes, National EMS Institute Inc. is able to offer discounted rates with a local hotel in the area, since most of our students are from out of state. Housing is available on a First come, First Serve basis. Contact our Housing Director, Giselle 1-508-946-4400 for pricing information. Q: Where can we do Laundry? A: A washer and dryer are available at the hotel for a fee to students. Q: Do you have a shuttle service? A: YES National EMS Institute does have a shuttle service available, Call for Pricing. Want to drive yourself? We also have contracted rates for rental cars. Q: Why do we need to wear a uniform? A: The National EMS Institute Inc. requires its students to wear a uniform to prepare them for a field that requires proper grooming and professional attire at all times. Q: Do I need to be CPR Certified before signing up for the course? A: NO, National EMS Institute Inc. certifies you on the first day of class to our standards. Q: What does 100% job placement assistance mean? A: National EMS Institute Inc. is well known in this industry and will work with you on a 1 – 1 basis to help you get a job. Q: When do I take my state exams? A: State Practical Exams are scheduled to take place within one to two weeks of the end date of your course. They are conveniently located at our Carver Campus, 90 Main St. Carver, MA 02330. You will schedule your NREMT Written Exam upon receiving confirmation of passing the course. Q: What is the pass rate of the 18 day course? A: National EMS Institute Inc. has achieved 100% pass rates with the Commonwealth Of Massachusetts.